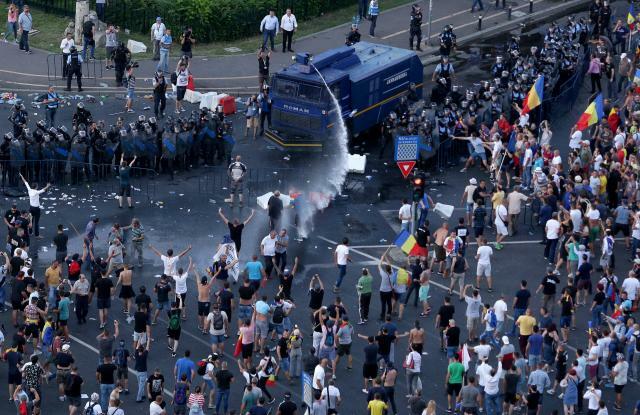 Tens of thousands of protesters rallied against the ruling Social Democrat (PSD) government on Friday in cities across Romania and the capital Bucharest, where riot police scuffled with some and fired tear gas. They joined tens of thousands outside government headquarters in scorching temperatures, waving Romanian and European Union flags and demanding the cabinet’s resignation. Messages projected on buildings around the square said “We are the people” and “No violence”. An estimated 3 to 5 million Romanians are working and living abroad, the World Bank has said, up to a quarter of the European Union state’s population, ranging from day laborers to doctors. They sent home just under $5 billion last year, a lifeline for rural communities in one of the EU’s least developed countries. Protests have repeatedly been held outside government headquarters since the Social Democrats took power in early 2017 and tried to decriminalize several corruption offences. Earlier this year, they pushed changes to the criminal code through parliament that have raised concerns from the European Commission and the U.S. State Department. The changes are pending Constitutional Court challenges. “Almost all of the public sector is malfunctioning, it must be changed completely and replaced with capable people,” said Podut.